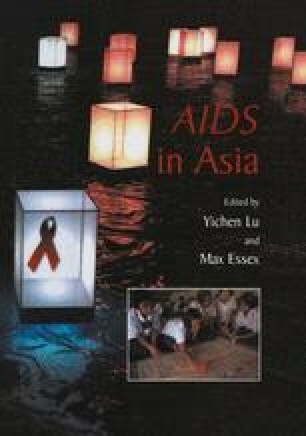 Southeast (SE) Asia is second only to Sub-Saharan Africa as the world’s most heavily HIV/AIDS affected region in terms of number of infections (UNAIDS, 2002). While epidemic spread of HIV-1 began relatively late in the region, largely in the 1988-1990 period, the virus has spread widely and rapidly, and affected many millions in this densely populated, ethnically variable and politically diverse region. SE Asia includes some of the world’s wealthier states (Singapore and Brunei), emerging economies (China, Thailand and Vietnam) and some of the poorest and most isolated nations (Burma and Laos). Its political spectrum spans emerging democracies, military dictatorships, Islamic Republics and three of the last five nominally communist states worldwide (China, Laos, and Vietnam). Also located in SE Asia are two of the world’s leading heroin exporters, Burma and Laos (Beyrer, et al., 2000). The ethnic and linguistic diversity of the region is extremely complex, as are the range of climates and ecologies—from rain forests and sparsely peopled mountains to overcrowded metropolises, with their associated socio-economic deprivations, poor housing and contaminated water supplies.